Description: (Obverse) the cross consists of a thunderbolt, the arms conjoined by wings, base bar terminating in a bomb, surmounted by another cross of aeroplane propellers, the finials inscribed with the royal cypher, GRI VI. A central roundel depicts Hermes mounted on a hawk bestowing a wreath; (Reverse) the royal cypher GRI, George VI, above the date 1918. Ribbon: Diagonal alternate stripes of white and crimson. Comments: This decoration, awarded to officers and warrant officers of the RAF, was instituted in 1918 for gallantry on non-operational missions and for meritous service on flying duties. 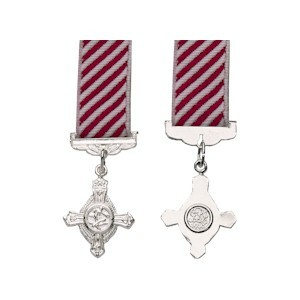 Since the 1993 review of gallantry awards it is now available to all ranks (the Air Force Medal having been discontinued) for non-operational gallantry in the air only (no longer for meritous service also).